There are places that you come back to over and over again—the ones that keep on surprising, the ones that keep bringing something new to the table. In this case, the world-class entity of Gelatofix Lifestyle Café. There’s so much to love about the Chicken Parmigiano—tender chicken in crisp coating, topped with heaps of spinach, marinara, and melted cheese, conveniently placed with a side of rice. Never underestimate the classic duo of Chicken and Waffles, crispy fried chicken chunks on top of warm, golden brown waffles. We’re counting this as a breakfast win. 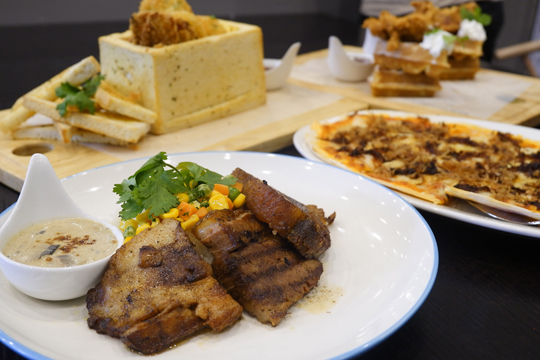 Dare to bite into Gelatofix Lifestyle Café’s new array of gastronomic dishes. To see what else is on their menu, visit them at the Ground Floor, BGC Corporate Center, 30th corner 11th Street, Bonifacio Global City, Taguig City.